The other day (on the 19th of February) in Bulgaria we marked 143 years from the hanging of Vasil Levski – a national hero, also called The Apostle of Freedom. He was one of the leaders of the revolutionary movement to free Bulgaria from the Ottoman ruling which lasted 500 years. 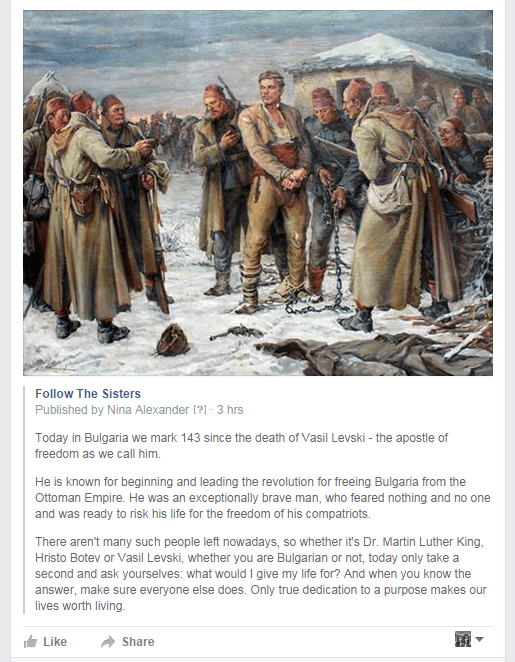 As a member of a Facebook group called “Foreigners in Sofia and friends” I decided I should share the information of the national holiday with the group members and even extend it slightly to inspire people to find the true value in their lives just as the man in question found value in his. To bring some clarity: Vasil Levski’s name represents everything Bulgarians believe to be bravery, integrity and nationalism. A wise, soft-hearted person who was also a priest, his name can bring the spark of national pride on any Bulgarians face. He means to Bulgaria just as much as Martin Luther King means to the African Americans (and to many others), as much as Rosa Parks and her quiet revolution, Columbus and Kennedy mean to modern Americans. Did any of these people have faults? Probably – they were all humans. Nevertheless, their achievements cannot and should not be ignored, nor should they be a reason for personal attacks and hatred in modern days. Apparently, that’s not what some foreigners in Sofia think. Soon after I shared the image and my message in the group, I started seeing answers that I could never imagine receiving. Imagine telling Jews that nothing ever happened in the concentration camps and that nazis actually brought them good. Can you? This is exactly how ignorant and ugly this comment is. Once again – the death of the Apostle was only 143 years ago. Most of us, modern Bulgarians have heard stories from our grandparents about the slavery and they were not nice. Here’s how some people were murdered at the time for refusing to change their religion (and this is just one example). 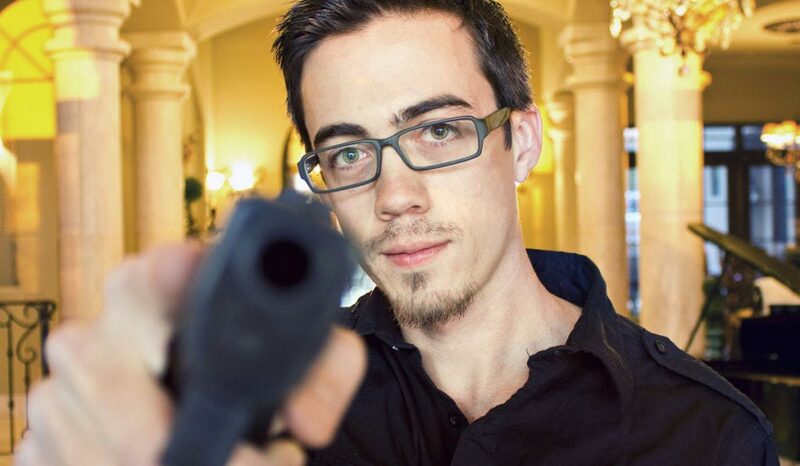 Now, to get back to the comments. You know the saying “The blind leading the blind”? Well, that’s what happened in our case. Another guy decided to echo the first one, and acuse me of propaganda. He appeared to beor Turkish origin. What annoyed me a lot is that I have never had an argument with a Turk. Nor is anything mentioned about Turkey in the above post. I spoke of the Ottoman empire, which as a matter of fact wasn’t very nice to it’s own people either. Nevertheless, the guy decided it was a personal attack. Naturally, I could not sit quietly and felt I should shut his mouth. As I have been told previously: we humans, are not trees. If we don’t like it somewhere, we can move which is apparently what this guy ought to do. I do not claim we shall remain in the past and continue blaming the ancestors of the wrong-doers. This would not be beneficial for anyone. We shall move on and there is no reason to hold a grudge against each other nowadays. Modern Germans did nothing to Jews and they should not be hated. Modern white Americans are not responsible for what their ancestors did either, and modern Turks did nothing to Bulgarians, so why hate? We personally have Pamukkale on our Bucket List and we’ve been to Kusadasi, loved it and recommend it and this doesn’t make us any less Bulgarians. But I shall not tolerate anyone insulting Bulgarian national heroes, especially if the person has decided to live here. 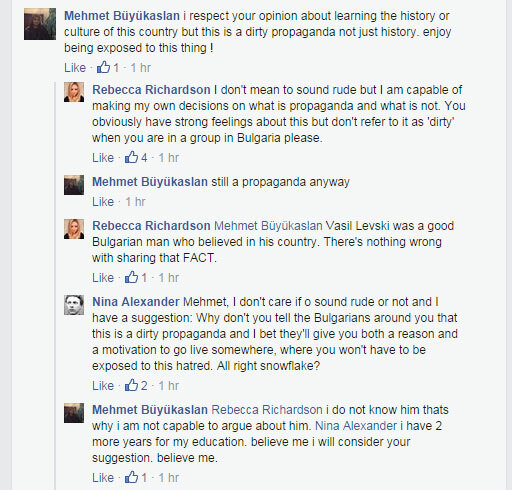 And I will not tolerate anyone telling me that educating foreigners on Bulgarian history is propaganda either, because you know what: that speaks loudly of the way the person feels about Bulgaria. And as much as some may not like to her it: there is no more Ottoman Empire. There is no more Byzantium either. 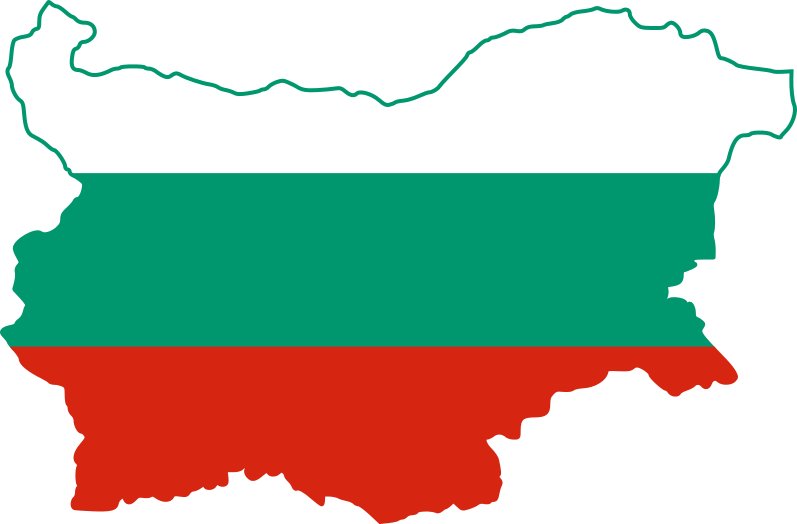 This is Bulgaria and the names of Vasil Levski, Hristo Botev, and many other shall and will be said with the due respect. You wouldn’t tell Americans that Kennedy was like Don Quichotte, would you? I am glad you stood up to him Nina. Bulgarian history is rich and should be respected. If anyone doesn’t appreciate the fact that you are educating them about the country they live in, then they shouldn’t be living in Bulgaria in the first place. Thank you for this comment Teddy! It feels really great having support on this topic! previous post: Trieste, Italy – YEA or NAY?